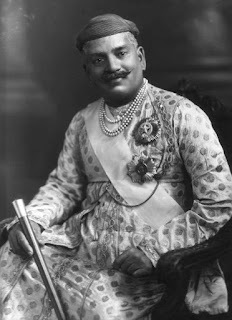 Sayajirao Gaekwad III (born Shrimant Gopalrao Gaekwad, 11 March 1863 – 6 February 1939) was the Maharaja of Baroda State from 1875 to 1939, and is notably remembered for reforming much of his state during his rule. Sayajirao was born Maratha at Kavlana as Shrimant Gopalrao Gaekwad, second son of Meherban Shrimant Kashirao Bhikajirao [Dada Sahib] Gaekwad (1832–1877) and Shrimant Akhand Soubhagyavati Ummabai Sahib. His branch of the Gaekwad dynasty was a cadet branch descended from a morganatic marriage of the first Raja of Baroda and so was not expected to succeed to the throne. Following the death of Sir Khanderao Gaekwad (1828–1870), the popular Maharaja of Baroda, in 1870, it was expected that his brother, Malharrao (1831–1882), would succeed him. However, Malharrao had already proven himself to be of the vilest character and had been imprisoned earlier for conspiring to assassinate Khanderao. As Khanderao’s widow, Maharani Jamnabai (1853–1898) was already pregnant with a posthumous child, the succession was delayed until the gender of the child could be proven. The child proved to be a daughter, and so upon her birth on 5 July 1871, Malharrao ascended the throne. Malharrao spent money liberally, nearly emptying the Baroda coffers (he commissioned a pair of solid gold cannon and a carpet of pearls, among other expenses) and soon reports reached the Resident of Malharrao’s gross tyranny and cruelty. Malharrao further attempted to cover up his deeds by poisoning the Resident with a compound of arsenic. By order of the Secretary of State for India, Lord Salisbury, Malharrao was deposed on 10 April 1875 and exiled to Madras, where he died in obscurity in 1882. With the throne of Baroda now vacant, Maharani Jamnabai called on the heads of the extended branches of the dynasty to come to Baroda and present themselves and their sons in order to decide upon a successor. “I have come here to rule”. He was selected by the British Government as successor and was accordingly adopted by Maharani Jamnabai, on 27 May 1875. He was also given a new name, Sayajirao. He ascended the gadi (throne) at Baroda, 16 June 1875 but being a minor reigned under a Council of Regency until he came of age and was invested with full ruling powers on 28 December 1881. During his minority he was extensively tutored in administrative skills by Raja Sir T. Madhava Rao who groomed his young protégé into being a person with foresight and with a will to provide welfare to his people. In this period Sir T. Madhava Rao restored the state to its normal conditions following the chaos in which it had been left by Malharrao. Not a little credit for what the Maharaja achieved during his life in every sphere of human activity must be given to F. A. H. Elliot. The learning which Sayajirao acquired under Mr. Eliot’s able guidance made him a great statesman, educator, and ruler. It is acknowledged that the Maharaja Sayajirao was a prince among the educators and an educator among the princes. On assuming the reins of government, some of his first tasks included education of his subjects, uplifting of the downtrodden, and judicial, agricultural and social reforms, . He played a key role in the development of Baroda’s textile industry, and his educational and social reforms included among others, a ban on child marriage, legislation of divorce, removal of untouchability, spread of education, development of Sanskrit, ideological studies and religious education as well as the encouragement of the fine arts. His economic development initiatives included the establishment of a railroad and the founding in 1908 of the Bank of Baroda, which still exists and is one of India’s leading banks, with numerous operations abroad in support of the Gujarati diaspora. Fully aware of the fact that he was a Maratha ruler of Gujarat, he identified himself with the people and shaped their cosmopolitan attitude and progressive, reformist zeal. His rich library became the nucleus of today’s Central Library of Baroda with a network of libraries in all the towns and villages in his state. He was the first Indian ruler to introduce, in 1906, compulsory and free primary education in his state, placing his territory far in advance of contemporary British India. To commemorate his vision and administrative skills, Baroda Management Association has instituted Sayaji Ratna Award in 2013, named after him. Though a prince of a native state, an admirer of the English people and in many respects of the English rule in India, he jealously guarded his rights and status even at the cost of annoyance to the British Indian Government. Sayajirao was often in conflict with the British on matters of principle and governance, having continuous and longstanding verbal and written disputes with the British Residents as well as with the Viceroy and officials in the Government of India. He was granted the title of Farzand-i-Khas-i-Daulat-i-Inglishia on 29 December 1876. He attended the Delhi Durbars of 1877, 1903 and 1911; it was at the 1911 Delhi Durbar that an incident occurred that proved to have far-reaching ramifications for Sayajirao’s relations with the Raj. At the grand and historic 1911 Delhi Durbar, attended by George V—therefore the first time that a reigning British monarch had travelled to India, each Indian ruler or “native prince” was expected to perform proper obeisance to the King-Emperor by bowing three times before him, then backing away without turning. As the third-most prestigious Indian ruler, Sayajirao was third in line to approach the King-Emperor; already, he had caused consternation among the British officials by refusing to wear his full regalia of jewels and honours (to lend a touch of exoticism, it was expected that the rulers on formal occasions would present themselves in jewels). While some accounts state that he refused to bow, Sayajirao actually did bow, albeit perfunctorily and only once before turning his back on the King-Emperor. According to his granddaughter Gayatri Devi, she states in her autobiography that due to some reason he had been unable to attend the rehearsals and didn’t know how to greet The King-Emperor. Other eyewitness reports state he walked away “laughing”. For several years already, Sayajirao had angered the British by his open support for the Indian National Congress and its leaders; the incident before the King-Emperor proved to be the last straw. The British never fully trusted Sayajirao again, although he was openly forgiven when he was awarded a GCIE in 1919. During his reign a large narrow gauge railway Gaekwar’s Baroda State Railway network, which was started in 1862 was expanded further with Dabhoi at its focal point, a network that still is the largest narrow gauge railway network in the world. Sayajirao envisioned a water supply scheme for Baroda in 1892 at Ajwa that would use gravity to supply drinking water to the people of Baroda. To this day a large portion of Vadodara City gets its drinking water from this source. Ajwa Reservoir, with 64 gates. The large public park originally called Kamati Baug and now called Sayaji Baug was his gift to the City of Baroda. On the occasion of the Diamond Jubilee of his accession to the throne, he set apart large funds out of his personal as well as of the state funds for setting up a University in Baroda for the benefit of students from the rural areas of his state…… a task which was ultimately completed by his grandson Sir Pratapsinghrao Gaekwad, who founded the Maharaja Sayajirao University and settled the trust as desired by his grandfather. This trust known as the Sir Sayajirao Diamond Jubilee and Memorial Trust exists today also and caters to the educational and other needs of the people of the former state of Baroda. He recognised talent from among his people. He supported education and training of persons who in his opinion would shine in life. Those persons whom he patronised included Dr. Babasaheb Alies Bhimrao Ramji Ambedkar, the architect of Indian Constitution; Dadabhai Naoroji, who started his public life as the Dewan (Minister) to the Maharaja in 1874 and thereafter went on to become the first Asian Member of the British House of Commons where he made no secret of the fact that he would also be representing 250 million of his fellow subjects in India.He also sent his Agriculture Commissioner Chintaman Vishnu Sane to The United States of America for research in that field. Sayajirao used to visit England every year to select outstanding young people to join his service and in one of such visits he met 20-year Sri Aurobindo whom he immediately offered a job at Baroda College. Sri Aurobindo returned to India in 1893 to join the Baroda service. The Maharaja supported and witnessed the successful flying of an unmanned aircraft constructed by Dr.Talpade in 1895, which happened eight years before the Wright brothers took to the skies. 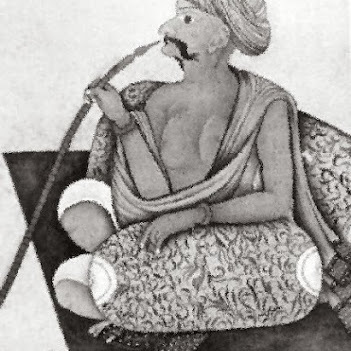 The Maharaja was a noted patron of the arts. During his reign, Baroda became a hub for artists and scholars. The celebrated painter, Raja Ravi Varma, was among those who spent substantial periods of time at his court. Sayajirao had a splendid collection of jewels and jewellery. This included the 262 carat (52.4 g) “Star of the South” diamond, the “Akbar Shah” diamond and the “Princess Eugenie” diamond. Sayajirao was also a patron of Indian classical music. Ustad Moula Bux founded the Academy of Indian Music under his patronage. This Academy later became the Music College and is now the Faculty of Performing Arts of the Maharaja Sayajirao University of Vadodara. Apart from Ustad Moula Bux, Sayajirao’s court boasted great artistes like Ustad Inayat Khan and Ustad Faiyyaz Khan. In 1914, the first All India Music Conference was held in Baroda. The Maharaja Sayajirao University of Vadodara—a city only two hours by train from Ahmedabad—started the first dance programme in India in 1950. Over the centuries there had been many alliances and marriages between Baroda’s kings and princesses. Dancers were often part of the dowry as dancers, poets and musicians were status symbols for the royal courts and maharajas had as many artists as they could afford. In 1880 the Maharani Laksmi Bai (Chimnabai I) of Tanjore was married to Baroda’s Maharaja Sayajirao III Gopalrao Gaekwad, an enlightened prince who after ascending the throne established the Baroda College as one of his first public acts. It was later absorbed into the university that bears his name. Chimnabai I was knowledgeable in Bharatanatyam and Carnatic music, and brought a troupe with her comprising two dancers, two nattuvanars (leaders of Bharatanatyam concerts) and two teachers (Khandwani 2002). Others followed later, including Nattuvanar Appaswamy and his dancer wife Kantimati, who had studied with Kannusamy and Vadively, two members of the Tanjore Quartet. After the death of Appaswamy in 1939, Kantimati and their son,Guru Shri Kubernath Tanjorkar,left Baroda to teach in Lucknow,and then worked in the film industry in South India until Sayajirao’s successor, Pratapsinhrao Gaekwad recalled the family to Baroda in 1949 to teach in the Music Department in the Kalavan Palace, later absorbed into the Maharaja Sayajirao University (Gaston 1996: 158-160).Later Guruvarya Shri Kubernath Tanjorkar established his own Institute namely Tanjore Dance Music & Art Research Centre at Baroda with his Son Guru Shri Ramesh Tanjorkar and Guru Smt.Leela R. Tanjorkar(Kubernath Tanjorkar’s Family is devoted to Bharatnatyam dance now including their grandsons Rajesh and Ashish). So what we have here is a tradition of very distinguished Bharatanatyam dancers and teachers, members of a family considered an offshoot of the Tanjore Quartet bani (stylistic schools; Gaston 1996: 159), already established in Gujarat by the time Mrinalini sets up her own academy. Yet there is a sense that what she did was not new. Pratap Singh Gaekwar, who succeeded to the throne in 1939 as Maharaja of Baroda. 2) Shrimant Maharajkumar Shivajirao Gaekwad (31 July 1890 – 24 November 1919); had two sons and one daughter. 3) Maharani Indira Devi, Maharani and Maharani Regent of Cooch Behar (Indiraraje) (19 February 1892 – 6 September 1968). Married Jitendra Narayan of Cooch Bihar in 1911; had issue. Her descendants include the models Riya Sen and Raima Sen. She became a Maharani Regent of Cooch Behar and the mother of Gayatri Devi of Jaipur. 4) Lieutenant-Colonel Shrimant Maharajkumar Dhairyashilrao Gaekwad (31 August 1893 – 5 April 1940); had three sons and two daughters. Other descendants of Sayajirao would wed the rulers of Kolhapur, Sawantwadi, Akkalkot, Jath, Dewas Jr., Kota, Dhar, Jasdan, Sandur and Gwalior. About Indian classic music by various musicians. I remember that ticket for attending only five rupees. I am in USA living but my ambition is to see Laxmi Vilas palace in my life.